REGION – As the fairgrounds in Del Mar are transformed into the place “Where the West is Fun” for the 2017 San Diego County Fair, one burning question remains: What is Charles Boghosian frying up this year? 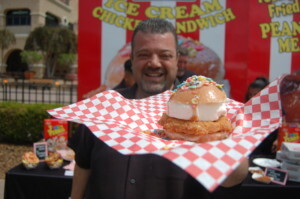 Charles Boghosian, better known as Chicken Charlie, shows off the Krispy Kreme chicken ice cream he created for the 2017 San Diego County Fair. It’s a fried boneless chicken breast and 5-ounce slab of Blue Bunny vanilla ice cream between two jelly doughnut halves topped with Fruity Pebbles. It’s a fried boneless chicken breast and 5-ounce slab of Blue Bunny vanilla ice cream between two jelly doughnut halves topped with Fruity Pebbles. Dressed-to-impress octopus on a stick from Reno’s Fish and Chips will be served with a variety of dipping sauces. Other culinary offerings include Boghosian’s fried peanut butter meatballs, buffalo chicken or cheese ravioli on a stick from Pignotti’s and octopus on a stick from Reno’s Fish and Chips. Fairgoers can also pig out on bacon-wrapped asparagus with cayenne pepper and pineapple or Brussel sprouts topped with parmesan cheese at the Bring Home the Bacon stand. Grilled Cheese A-Fair will offer “animal-style” patty melt or jalapeño pepper and bacon sandwiches served with mesquite barbecue potato chips. An authentic Wild West Saloon will be serving the Rooty Tooty Cocktail, made with sarsaparilla and spiced rum. 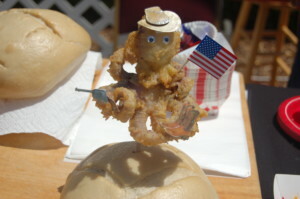 In addition to food, rides and nightly concerts that include Patti LaBelle, Toby Keith, Darius Rucker and Switchfoot, to name a few, this year’s annual fair will feature activities and exhibits such as a cattle drive, panning for gold, camping out on the prairie, a frontier town and art and displays about this historic time in the United States. 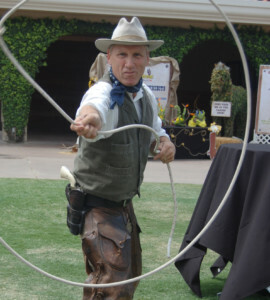 Will Roberts shows off his roping skills. Fairgoers can expect to encounter famous outlaws such as Jesse James or Black Bart and meet the fearless women of the West, including Calamity Jane and Annie Oakley. They will also learn how to saddle up, rope and ride man’s best friend of the time. Journey to the Winner’s Circle will celebrate the pageantry, traditions and history of horse racing at the Del Mar Fairgrounds as the seaside venue prepares to host its first Breeder’s Cup in November. Also planned are a quick “draw” contest for artists, who must create a plein air painting in four hours, cowboy poetry, ghost towns, Western arts, crafts and costumes, recognition of the Native American contribution to the Wild West, a beard and moustache contest and cow chip bingo. Because agricultural is at the core of all county fairs, this year’s event will again highlight area 4-H and Future Farmers of America clubs. On July 1, youth will auction off their livestock to raise money for scholarships. “It’s a wonderful tradition that reminds us of our agricultural roots as we become a more urban environment,” said Fred Schenk, director of the fair board. For those who need a break from the action or some healthy food options, nine-year sponsor Albertsons/Vons will have market area selling everything from fresh fruit and wraps to diapers and stomach relief aids. The San Diego County Fair is the largest in California and fifth largest in North America. It opens at 4 p.m. June 2 and runs through July 4. It will be closed the first four Mondays and three Tuesdays. 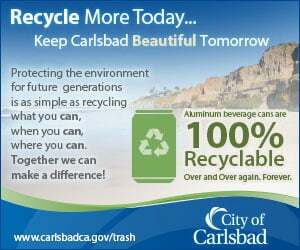 Visit Sdfair.com for more information and a schedule of events.